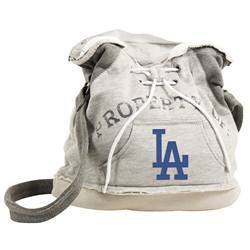 Sweatshirt-style Los Angeles Dodgers Hoodie Duffel Bag. Los Angeles Dodgers Hoodie Duffel Bag features two internal patch pockets. Frayed accents. Tied drawstrings. Carry strap. Sturdy magnetic closure for security. Contrasting heather grey material on handles of the bag help to keep the Los Angeles Dodgers Hoodie Duffel Bag looking clean. Each bag features a distressed "PROPERTY OF" and the Logo of Los Angeles Dodgers displayed largely on the front. Measures 13" Length x 6.5" Width x 16" Height.